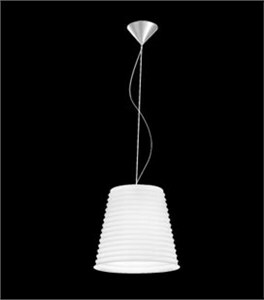 DESCRIPTION A conical, ribbed glass diffusers available in 3 sizes, highlight this design. Incandescent light sources provide downlight and diffused illumination through the hand-blown, white and clear glass pendants. Companion wall, ceiling, table, floor and other pendant designs are available. CONSTRUCTION Glass diffusers are suspended with cable and a single clear cord, to a cone-shaped, brushed aluminum canopy that mounts directly to a standard 4� junction box. 10 foot cord and cable is standard, but additional is available upon request. A ceiling support for �swag� application is available (see detail above) or 2 can be used to hang 2 pendants from one outlet. LIGHT SOURCE 1 x 100 watts, incandescent, A-19, medium base (provided).